After my purchase of the Replica, it was just used for scaring myself silly on the occasional track day. I was not in a position to campaign the bike properly, lacking the budget and also busy working on my EFI RGA project (see main Breganzane site). By late 2007 things were such that I could consider giving the bike a competition outing again. 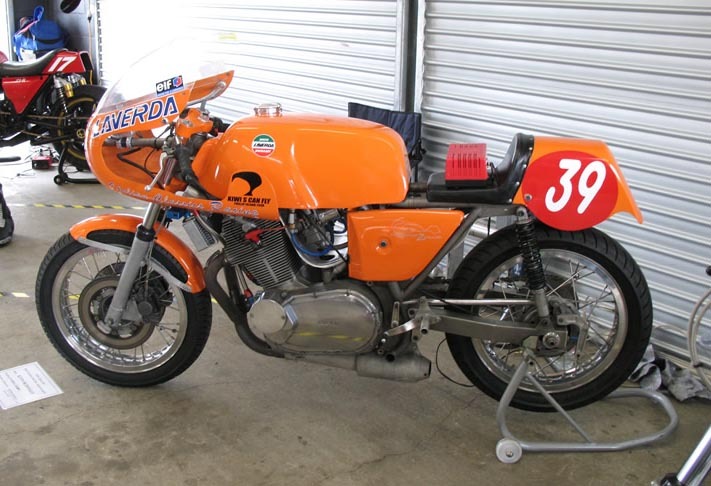 In discussions with the bike's previous owner Chris Cutler, we decided to jump in the deep end and do the Phillip Island Classic - at that time clearly Australia's Premier historic race meeting, attracting all the best bikes and riders from Australia, New Zealand, the UK and beyond. It was more of a toe in the water than a serious tilt. With myself, the rider, the bike and the track all essentially unknown to one another. At least Chris Cutler was joining us, bringing his significant experience. But Italian Classics Racing were back on the track, the first time with Breganzane influence!